Drawing a Five pointed Star, 2016. 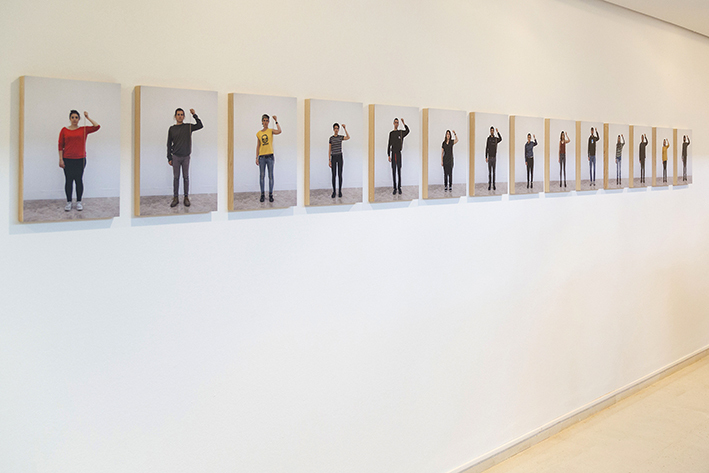 14 fotografías, 39 x 26 cm, c.u. 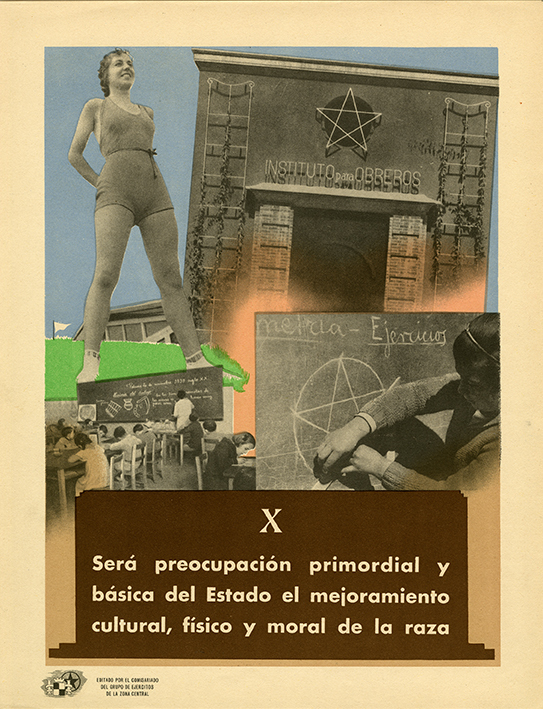 Point number ten in the Declaration of Principles of the Government of the Spanish Republic, also known as “Negrín’s Thirteen Points”, is particularly striking because of its ethically questionable content: “A primary and basic concern of the State will be the cultural, physical and moral improvement of the race.” The photomontage, attributed to the artist Josep Renau, shows the athletic body of a young woman superimposed on the building of the Workers’ Institute, on the façade of which, above the entrance, there is a five-pointed star with intersecting lines, geometrically forming a Cartesian star. This star is also inspired, albeit very schematically, by the five-pointed red star adopted by communism. In addition to the proletariat, it symbolised the five continents and the five fingers of the hand. 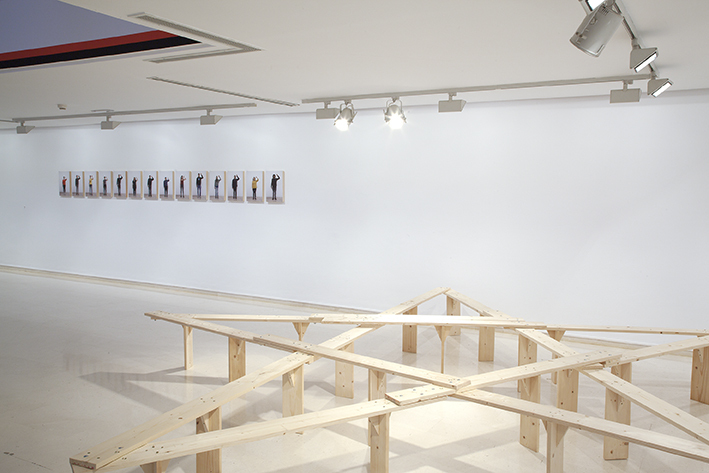 Drawing a Five-pointed Star consists of a series of photographs and a wooden bench. 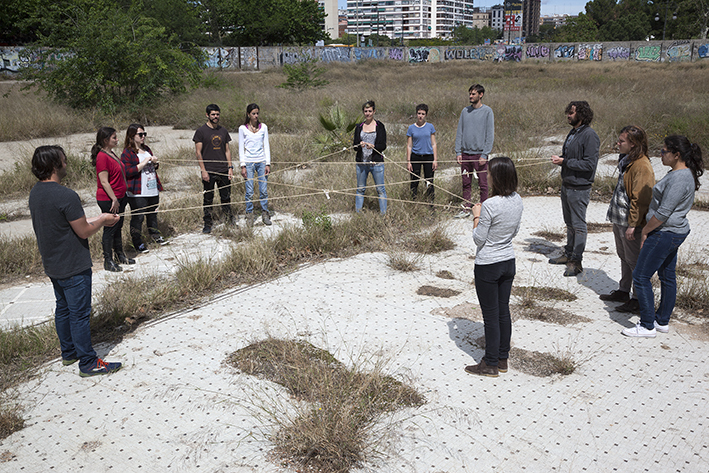 It was made with the collaboration of the participants of the similarly titled workshop conducted in May 2016 in the Faculty of Fine Arts in Valencia, with the Workers’ Institute as the central focus. In the workshop there was a critical reflection on the status of the workers’ movement, the workers’ international, the unity of the proletariat, the relevance of symbols such as the red star and the idyllic representation of the worker’s body as a healthy, useful machine for work. 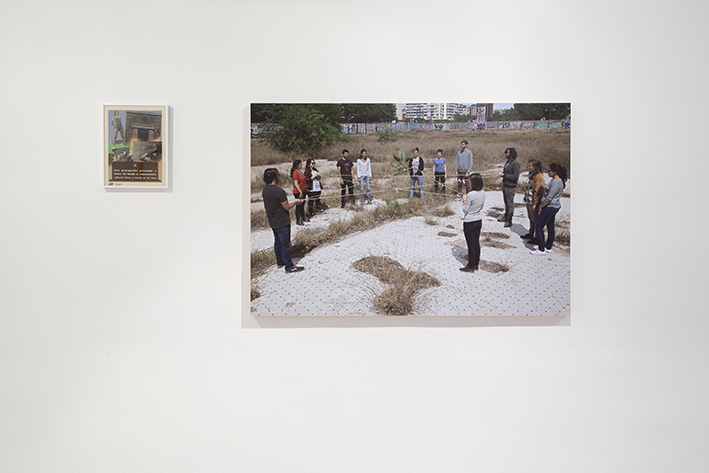 Two activities directly connected with the exhibition were carried out during the workshop. 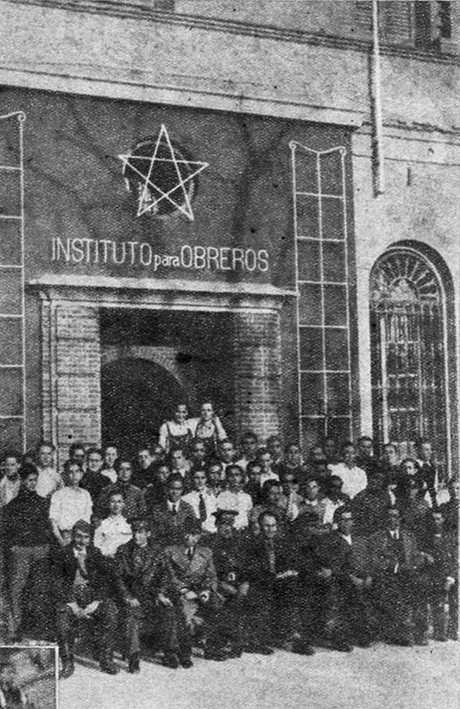 The first consisted in taking a group photograph in a part of the Institute that had been demolished, using the bodies of the students in the workshop as vertices to form a five-pointed star like the one that appeared on the façade. 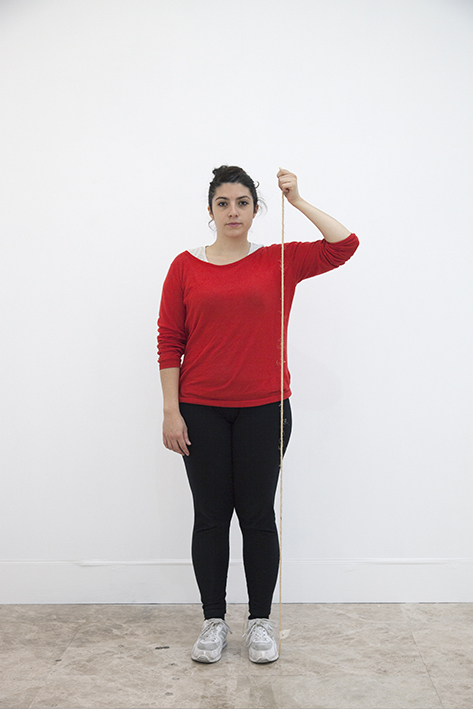 The star was drawn with knotted cords, with each piece of cord corresponding to the height of one of the students. 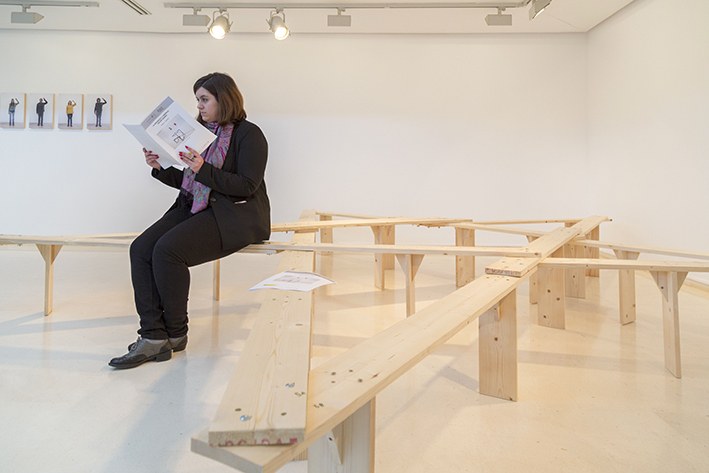 The second activity consisted in constructing a collective bench. Each length of wood was cut in proportion to the personalised measurements of the pieces of cord. All the pieces of wood were joined together to form a five-pointed star- shaped bench with an irregular, imperfect outline, unlike the star that served as a reference.